Hey there! I’m curious to know how your reference files are looking after all the hard work you put in last week. If you’re like most people, you ended up purging roughly half of the papers in those files. So now that you’ve got your system for organizing tax documents in place AND your reference files cleaned out, we can now move onto the home office declutter process. The home office is one of the more complex spaces to organize because there are lots of moving parts. Therefore, we’re going to focus on completing the first 3 steps in the 5-step organizing process this week: Evaluate, Sort, and Purge. We’ll move onto the Organize & Maintain steps next week. Grab a pen and a notepad and take a seat at your desk. Look around your home office and write down all of the functions you would like this room to serve. What tasks take place in here now? Are there any tasks that you’d like to add or subtract from that list? After you flesh out the specific functions of your home office, it’ll become clear what things belong in here and what things need to go. While you’re sitting at your desk, also write down what’s currently working in that space and what might need some tweaking. Could the room function better by rearranging the furniture? Is there a hard-to-open file cabinet drawer that prevents you from filing? Do you constantly have project papers cluttering up your desk because you don’t have a designated place to store them? Make a note of these things so they can be addressed this month as you declutter/organize the space. Since you’ll be completely emptying out each shelf, drawer, bin, etc., this is a great time to give all of these areas a thorough cleaning. Remember that declutter kit we created back in January? You get to put it to use this week during the sort and purge process! 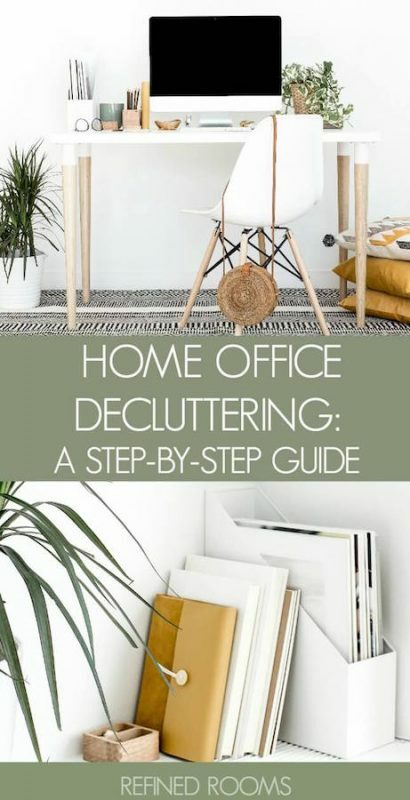 Remove all of the items within the area of the office you’re decluttering and bring them to a nearby sorting area (this can be a table, bed, countertop, or even the floor if your back can handle it). Do an initial rough sort by setting aside items that need to be moved to another room (these go in your RELOCATE bin). Next, set aside items that you immediately know you want to get rid of. Place these items in your RECYCLE, TRASH, or DONATE bins accordingly. Designate a larger container for PAPERS and place any loose papers that you come across during the sort process into this container. We’ll deal with sorting/purging paper after all of the items have been decluttered. Once you’ve removed the items to be relocated, gathered up all of the papers, and quickly tossed those no brainer items, it’s time to deal with what’s left. Sort what remains by putting like items together into categories. Once you see all of the items in each of your categories, it’s time to get ruthless. Use your purging prompts to make good decisions about what items truly deserve a space back in the room. Consider the quantity of items you have in each category and downsize as much as possible. Get rid of anything that’s old, outdated, broken or generally unusable. If you’ve got multiples of an item, keep the highest quality/newest one and donate the rest. Since you just organized your reference file system last week, go ahead and file papers in the long-term reference category. Once papers in the Toss category have been recycled/shredded, you’re left with just the Action and Handy Reference piles. If you’ve already got a system for containing these types of paper, go ahead and incorporate those papers into your system. If not, take a look at my recommended systems for organizing action papers and handy reference papers. After you’ve completed the decluttering step, share a photo of your KEEP categories on Instagram (use the hashtag #OrganizeandRefineChallenge and don’t forget to tag me) and/or share it in the Refined Rooms Facebook community. These are great tips, Natalie! The home office is the hardest room to declutter, and you have given us great directions. Thank you so much for sharing in out No Place Like Home decluttering challenge. I’m glad you find the tips valuable Sherry! 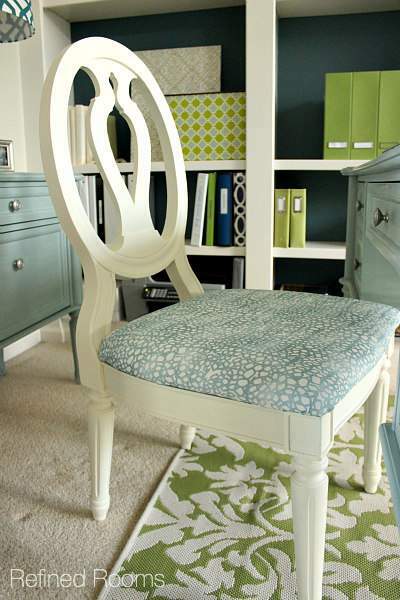 The home office can pose lots of challenges since decluttering is typically paper-heavy!